Time to look at some embroidery project progress! Thanks heaps for all the input on color selections the last time we discussed this particular embroidered kaleidoscope, which I am officially naming today. I’ve mentioned before that I have a problem coming up with names for my embroidery projects. But this one fell in my lap. I’ll tell you all about it. We’ll also discuss color vs stitches. Not that the two things are diametrically opposed when working an embroidery project, but in this case, in my mind, they’ve separated from each other. When working my way through an embroidery project like this – one that is open to a million interpretations and that I don’t have a solid plan for – I start by just stitching different elements, to see how I want to interpret them. If it becomes glaringly evident that something I’ve stitched isn’t going to work, I’ll pick it out and approach that element again. And if I try another approach, and it isn’t going to work either, I’ll pick it out and approach it yet again. It’s all a matter of playing around with ideas. 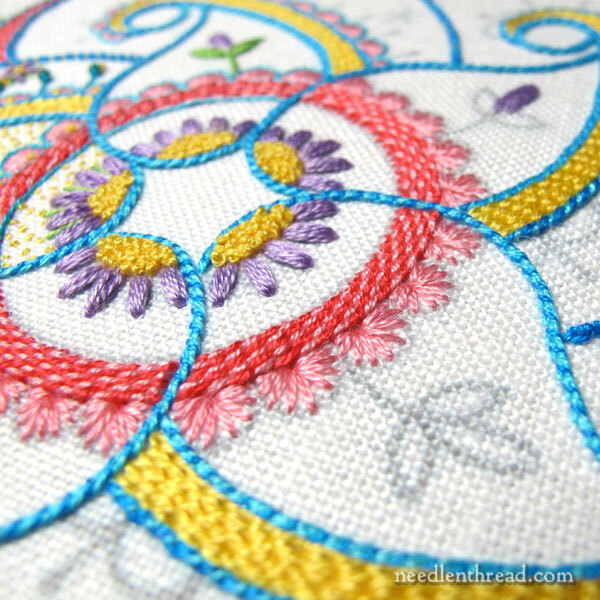 This is one of the reasons I love good embroidery linen – it takes a picking and keeps on stitching! That is, if you’re using good linen, you can pick out stitches, leaving nary a blemish on the fabric, restitch, and, if you have to, pick it out again. The fabric holds up. The same can’t be said for most other fabrics, but linen is a superstar in this regard! Once I’ve tried all the different elements with stitches that I think will work and I’m mildly satisfied with them, it’s just a matter of filling out the whole design from there. 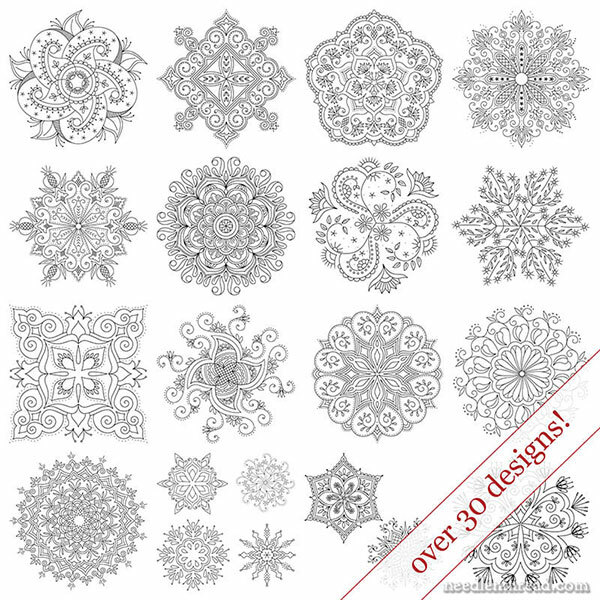 On these kaleidoscope designs, this may seem like a lot of repetition, but in fact, with the number of design elements in them and the variety of stitches used, it’s never boring! You can always move on to another element and another stitch, and then come back to previous areas. This weekend, I stitched in a lot of scallop fillings, using the “cheater” scallop approach that I talked about in this article on buttonhole scallops, only without the picots. The scallops on this particular project will be outlined with a different color. The majority of this design is worked with two strands of DMC floss, but there are a few details that require just one strand. I’ll list the colors I’ve used as soon as I get to the point of certainty in a couple areas that I’m still mulling over. I also added some of the leaves, in green, to pull some of the green accents from the middle out to the edge. Besides, it’s a leaf. My paltry imagination couldn’t go beyond leaf = green. I also wanted to echo the seed stitching again. The jury’s still out on the leaf. We’ve already talked about the color scheme on this wild thing. It’s a bit all over the place. But I’m sticking with it. I’m actually having fun with it. Sure, it might be a bit garish, but it’s fun, and I’m just testing stitches, so I’ve somehow separated the whole color question from the stitch question in my mind. It seems to have worked! I probably shouldn’t mention that she made the remark with zero enthusiasm. Her birthday cake didn’t settle well, so she saw those sprinkles twice, poor kid. In any case! Birthday Bash it is! It fits with my Celebration themed kaleidoscopes. So far, we have Tulip Festival (that’s a shout-out to a local festival we like to go to every spring), Party in Provence (which I finished earlier this year), Octoberfest! (which is available as a pattern and stitch guide), and this one, Birthday Bash. This week, I have to tackle some other projects, so I’ve packed Birthday Bash into its pillow case and zipped away all the threads into a pouch, to languish until I can revisit the project at the end of the week. For now, other big stuff to tackle, including…some stitch tutorials, preparations for a massive video session at the end of the month (more on that later), setting up a small project to demo the notion of “what stitch where and why,” some embroidery archeology, and other delectable pursuits. You know how it is – if you have a needle and some thread, the fun never ends! I like garish all the colours are great and I like the name and your stitching is lovely. I agree that good quality linen is great for picking out and stitches, I’ve done that on many occasions. its looking lovely. I can’t wait for the video session and stitch tutorials that sounds exciting. Thanks for sharing your progress on the Birthday Bash project with us and for your future posts. Happy stitching. Hi Mary, Any chance you’ll be turning Party in Provence into an ebook? Would love to know the colors you used. Hi, Beth – yes, I will, in one form or another! Mary — I have one of weird questions… What are the stitches you used to make that beautiful circle or arc? (With an implicit How do you stitch it?) 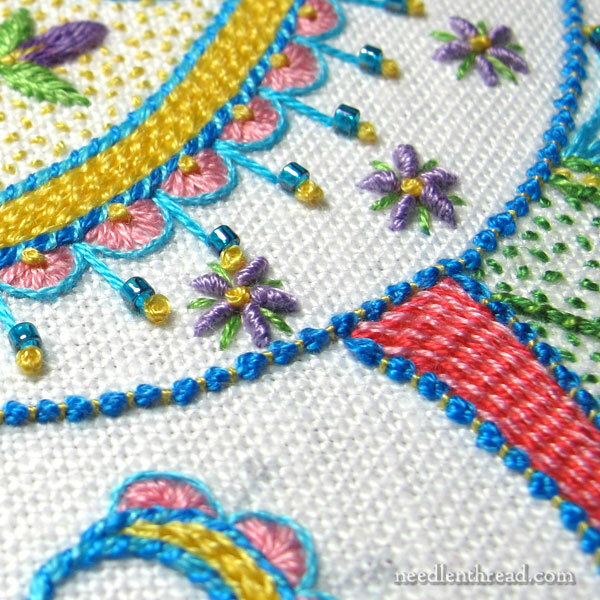 It looks like an electric blue French knot alternating with a yellow dot. It encircles the purple flowers. It is so pretty and I love the texture of it! Thanks! Hi,Phoebe – it’s Palestrina Stitch. 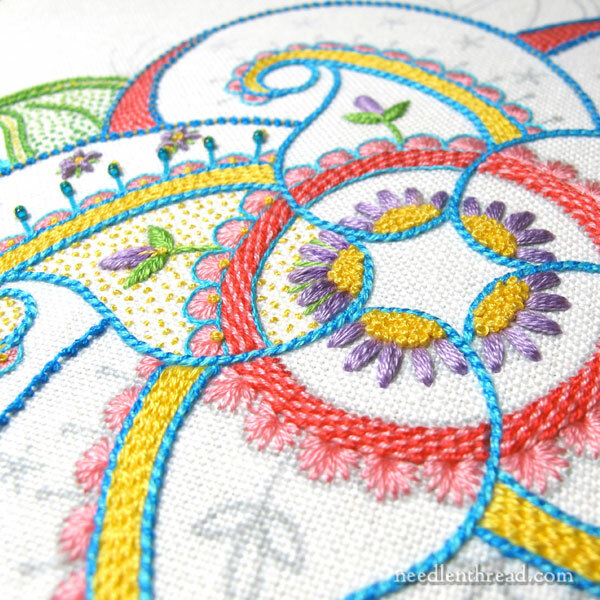 You can find the video tutorial for it here: https://www.needlenthread.com/2007/04/palestrina-stitch-video-tutorial.html I couched between each stitch using one strand of yellow. I’ll be covering all the stitches used in this project, and the colors, number of strands,all that, here on the blog, once I finish the whole thing up. As always I love when I get notification of a new blog post – especially regarding these kaleidoscopes! Your work is so fantastic (and your writing as well). Quick question – for the kaleidoscopes – do you back your ground fabric??? Thank you for the quick feedback! Southern Belle Muslin is it? I am having trouble finding a good quality backing fabric… where might I find some .. online? I like Southern Belle muslin, too, and normally, I find it online. Lately, I’ve been getting it here through Amazon, because the shop I used to order it from doesn’t carry it anymore. Really, though, any muslin from a fabric or quilting shop would do the trick! Another option is cotton batiste. It’s much lighter than muslin. You can find it at most fabric shops, either locally or online. I think it’s happy looking. Maybe I just don’t know any better . I just signed up for your blog (found you thru Pinterest) because I want to learn how to hand embroider. Hi, Barbara! Thanks – I think it’s happy looking, too! It puts me in a good mood, every time I have a chance to stitch on it, and I think that has a lot to do with the colors! I like the colors and the stitches. It might not be considered “artsy” embroidery by some, but I think it’s lively and happy. And I like all the texture in the different stitches. I really like the wrapped outlines. I’m going to try that on something. Is that backstitch that’s wrapped with another color? Hi, Teresa! Thanks! I’m glad you like it! That wrapped stitch is actually whipped chain stitch. The chain stitch is worked with two strands of floss, and then I whipped it with one strand. Hope that helps! Mary the project is really progressing beautifully. It’s kind of like a burst of spring. If I may ask where did the pattern come from? Hi, Eve – I drew all the kaleidoscope patterns I’m using. I’ll be making them available soon! Hi Mary. One polite inquiry, any chance of making an e-book for tulip festival and birthday bash. I think they go well together in terms of colors. They are both very colorful! Hi, Percy – I’m working on a couple options to get them both out. I’m hoping to have something ready for you by November! Hi, when you speak of a good embroidery linen what count and type of linen are you speaking of please? Hi, Cie – there are many brands of linen that are made specifically for needlework. These are normally available through locally owned, small needlework shops – many of which can be found online. My favorite brand is Legacy Linen, from Access Commodities. It’s available online through Needle in a Haystack and other online small needlework shops. I am enjoying the progress of this design, Mary. 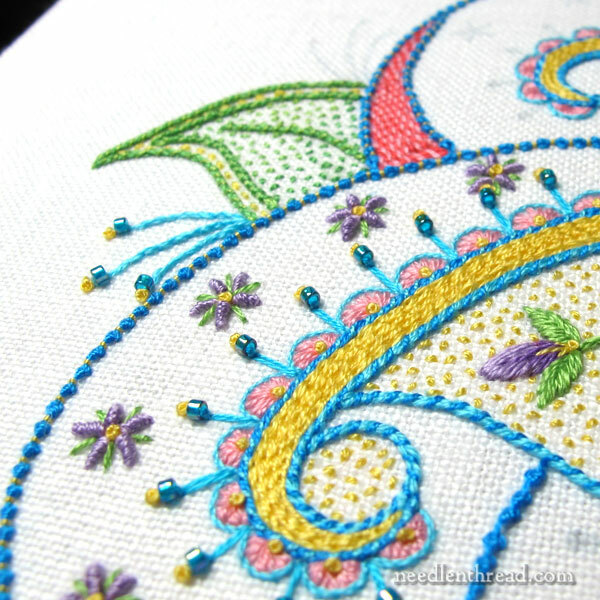 Which stitch did you use for the yellow and coral fill? Your stitching is inspiring! Hmmmm… Hi, Sue! There’s no yellow and coral fill? There’s a light pink and dark pink fill, and then the yellow filling. So the yellow filling is just chain stitch. And the dark pink and light pink is a diagonally striped raised band. You can find a tutorial for that here: https://www.needlenthread.com/2012/05/stitch-play-diagonally-striped-raised-band.html Hope that helps! Sorry! I didn’t mean to imply it was one fill. Wow the yellow is chainstitch – is it compacted together? You were right to guess I was talking about the pink fill. I will have to try that stitch! Thanks, that was very helpful. Just a quick note to say I love your emails and your website. Thank you for being our stitch guardian – keeping hand embroidery alive. 🙂 Hi, Page – well, that is a very nice compliment! Thank you! I don’t normally sell my project prototypes, but if I ever change my mind on that, I will let you know!